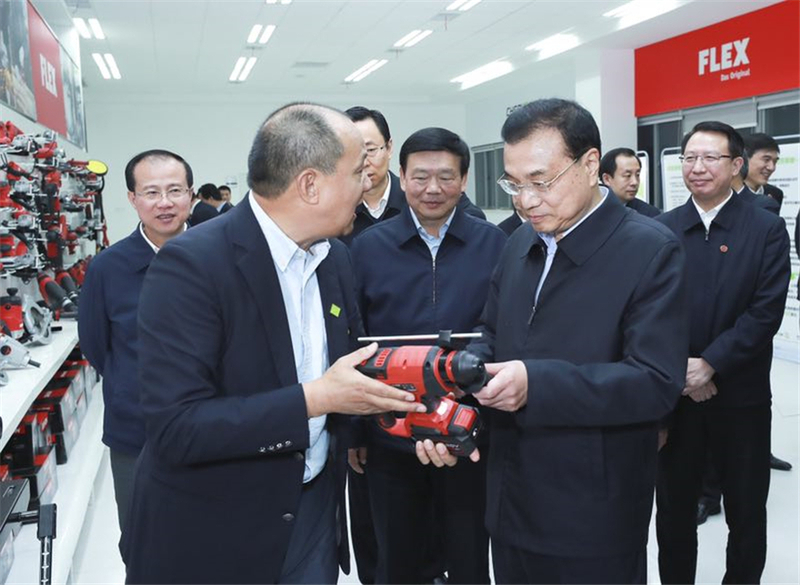 On November 29, 2018, Premier Li Keqiang visited Chervon. Premier Li Keqiang listened to Chairman of Chervon Mr. Pan Longquan's report on the company's main business, products, development history, core competencies and corporate culture. While visiting the product exhibition hall, Chairman Pan Longquan introduced our branding products of power tools and garden tools which are independently developed, designed and manufactured by Chervon. Premier Li Keqiang also tried the product himself with great interest and personally experienced the product performance. Walking through the second floor office area, the staff welcomed the Premier with warm applause. The Premier also cordially asked where the employees came from. In the research and development area of nearly 100 people, the Premier randomly made a small investigation: any non-local students here please raise your hand. About two-thirds of the people raised their hands. The Premier applauded that this shows that Nanjing is an open and dynamic city. Later, the Premier came to the production workshop to visit the employees, and to learn more about the production and operation, employment and effectiveness of the company. The Premier said: you have established brands through R&D and innovation, and formed a “three-in-one” competency together with the mainland labor cost advantage and the comparative advantage of the manufacturing industry. This is a typical case of the traditional domestic industry moving towards the middle and high end. The Premier also asked "what difficulties does the company have at the moment", Chairman Pan Longquan replied: As long as the country insists on reform and opening, we will have no problem. The Premier immediately said: We will unswervingly deepen reform and open wider to the world! At the end of the visit, all employees gathered around the factory gate to say goodbye the Premier and the Premier cordially shook hands with everyone. Chervon will keep in mind the teachings of the Premier, accelerate the pace of transformation and upgrading, continuously improve the competitiveness of company, create outstanding value through continuous innovation and improvement, win the customers, win the market and win the world. The purpose of this article is to record current events truthfully and not for any commercial purposes or advertising purposes, including but not limited to corporate promotion, product marketing, commercial promotion, etc.